What is the origin of the term "United Nations"? - Ask DAG! What is the origin of the term "United Nations"? 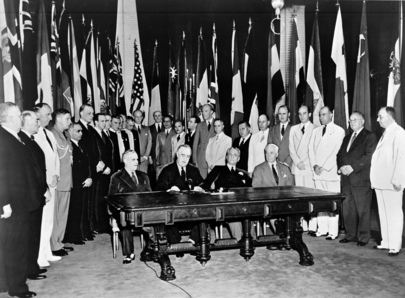 The name "United Nations", coined by United States President Franklin D. Roosevelt was first used in the Declaration by United Nations of 1 January 1942, during the Second World War, when representatives of 26 nations pledged their Governments to continue fighting together against the Axis Powers. A longer account is available from the 1946-47 volume of the Yearbook of the United Nations (link below).